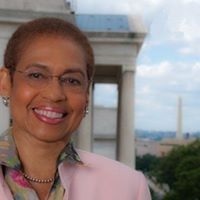 WASHINGTON, D.C. – (RealEstateRama) — Congresswoman Eleanor Holmes Norton (D-DC) today said that, with Democratic control of the House of Representatives for the first time in eight years, she will engage in a number of strategies to make District of Columbia residents equal to other Americans. Norton said she will push for a vote on the House floor on her bill to make the District a state. In 1993, Norton got the first and only floor vote on D.C. statehood. However, because of the difficulty of getting the statehood bill through the Senate, even if it gets through the House, Norton will simultaneously push the House to take up the 16 bills she has introduced this Congress to expand and round out home rule for the District. With Democrats in control of the House, Norton is likely to become chair of a subcommittee of special benefit to D.C. and will have a vote on the House floor in the Committee of the Whole. Norton has had this vote when Democrats have controlled the House. In 1993, the Democratic-led House defeated Norton’s D.C. statehood bill by a vote of 153 – 277. This Congress, Norton has achieved a record number of cosponsors for the statehood bill in the House (175) and Senate (29). Norton has introduced or announced the following bills to expand home rule so far this Congress. The District of Columbia Paperwork Reduction Act (H.R. 1479) would eliminate the congressional review period for D.C. bills. The District of Columbia Local Prosecutor Establishment Act of 2017 (H.R. 1523) would allow the District to prosecute all crimes committed under its local laws. Currently, the U.S. Attorney for the District prosecutes almost all crimes committed by adults under local D.C. laws. The District of Columbia National Guard Home Rule Act (H.R. 1658) would give the D.C. Mayor the authority to deploy the D.C. National Guard for local matters. Unlike governors of the states, and even territories, the District’s chief executive officer has no authority over its local Guard. The District of Columbia Home Rule Clemency Act (H.R. 1765) would give the District exclusive authority, like the states and territories, to grant clemency to offenders convicted under its local laws. Currently, this authority is exercised in D.C. by the President. The District of Columbia Civil Enforcement Equality Act (H.R. 4678) would allow the District to enter into contracts with private attorneys to sue on the District’s behalf for violations of D.C. law that may otherwise go unpunished due to a lack of resources. States, cities and most federal agencies have the authority to enter into such contracts to sue for violations of their laws. The District of Columbia Home Rule Non-Discrimination Act (H.R. 5265) would eliminate the applicability of the Religious Freedom Restoration Act of 1993 to the District. The District of Columbia Police Home Rule Act (H.R. 6129) would repeal the President’s authority to assume emergency control of the local D.C. police department. The District of Columbia Home Rule Bridges Act (H.R. 6153) would repeal a law that makes it a crime for a person in D.C. to obstruct any bridge connecting D.C. and Virginia. The District of Columbia Courts Home Rule Act (H.R. 6187) would give D.C. authority over the jurisdiction and organization of the local D.C. courts. The District of Columbia Zoning Commission Home Rule Act (H.R. 6215) would give D.C. the authority to appoint all members of the D.C. Zoning Commission. The District of Columbia Board of Zoning Adjustment Home Rule Act (H.R. 6289) would give D.C. the authority to appoint all members of the Board, except when the Board is performing functions regarding an application by a foreign mission with respect to a chancery. The District of Columbia Chief Financial Officer Salary Home Rule Act (H.R. 6670) would give D.C. the authority to set the salary of the CFO. The District of Columbia Special Elections Home Rule Act (H.R. 6710) would give D.C. the authority to set the date of special elections. The District of Columbia Public-Private Partnerships Home Rule Act (H.R. 7020) would give D.C. the authority to enter into public-private partnerships. The National Capital Planning Commission District of Columbia Home Rule Act (H.R. 7098) would remove the authority of the National Capital Planning Commission to review or approve the development of D.C. government-owned land. The Commission of Fine Arts District of Columbia Home Rule Act would remove the authority of the U.S. Commission of Fine Arts to review development of D.C.-owned parks and buildings, as well as development of certain private property in D.C.